Clark University initially became interested in predictive modeling due to an 87% growth in applications within three years. As exciting and encouraging as this was, it also presented Clark with a new set of challenges. In order to acclimate to the rise in student applications, they needed to make adjustments in admissions standards, financial aid and scholarship policies, as well as goals for the first-year class. Clark needed to find a way of doing this while also recognizing the importance of providing applicants with as many opportunities as possible to connect personally with staff and students from the university Moreover, all of these goals had to be met without increasing their admissions budget or staff. Initially, Clark’s admissions office decided to work with an outside predictive modeling consulting agency to identify which prospective inquiries were most likely to enroll, with the goal of increasing personalized outreach to those students. Unfortunately, they ran into a number of issues when working with a consultant: for instance, the result turn-around time took much longer than was beneficial to Clark, and lacked the level of detail that the admissions office was seeking..
With application review already underway, they began the search for an alternative predictive modeling approach that would be more beneficial at each stage in the admissions cycle After a careful investigation, including helpful conversations with other institutions, Clark turned to Veera Predict. With Rapid Insight, they gained a newfound confidence in their ability to use predictive modeling to achieve institutional goals. Clark also discovered that in-house predictive modeling allowed them increased flexibility and new approaches to asking questions using their own data. They no longer had to rely on an outside source for a one-time enrollment score. With their new method, Clark has found they can approach recruitment planning in new and varying ways for each stage of the process. Early on, the university learned the possibilities that come with using a predictive modeling tool in-house. They blended data from current students using Rapid Insight Veera Construct and were able to build a model that would predict first semester GPA. This identified students who are at-risk of attrition and could be used by academic support staff on campus to inform their approaches to student retention efforts. Additionally, the university used Veera Predict to build a summer melt model that could identify those students who had paid an enrollment deposit in the spring but who were at risk of not matriculating in the fall. “For us, that really showed the value of having a tool like this beyond just enrollment forecasting,” said Deveney. As Clark added new predictive modeling projects using Veera Predict, the effects on recruitment practices became clear. The culture of the admissions department at Clark relies heavily on personal engagement with potential and current students. When it came time to plan fall recruitment travel, Deveney built two distinct models: One pertaining to inquiry to applicant conversion, and the other to identifying good match high schools. Both are based on historical data. The results helped staff coordinate their fall travel. As they began to see results, putting the models to use themselves, staff increasingly came to trust the insights of the models. During application review and yield season, Deveney was also able to use the models to assist in planning communications. The admissions office used the models to assign candidates for interviews with alumni volunteers, which helped the University reach more of the students who showed strong likelihood of enrolling from the different regions where volunteers were based. In addition to scheduling conversations, the admissions office also developed a strategy to prioritize one-on-one outreach within that group of high match students, through the use of individualized emails and short video messages. Admissions counselors were provided with a list of students from their territories who were most likely to respond to such personalized outreach, and ultimately found that yield was higher for students who did receive the additional communication, validating the work that counseling staff do in building relationships over time with their most interested prospective students. 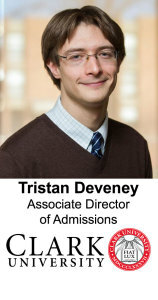 Watch this on-demand video featuring Tristan Deveney, Associate Director of Admissions at Clark University, to learn how they have brought predictive modeling in-house and have personalized their admissions process. Clark University continues to do a substantial amount of work on projects aimed to personalize its admissions efforts. On top of creating personalized emails and videos, the University recently launched communications campaigns designed to improve financial aid application completion rates and encourage both first-time and repeat visits to campus. Because the models allow the University to focus these efforts, the admissions office is also able to avoid the expenses associated with less effective mass mailings, which ultimately supports their goal of not increasing their admissions budget when having made the decision to use predictive modeling.